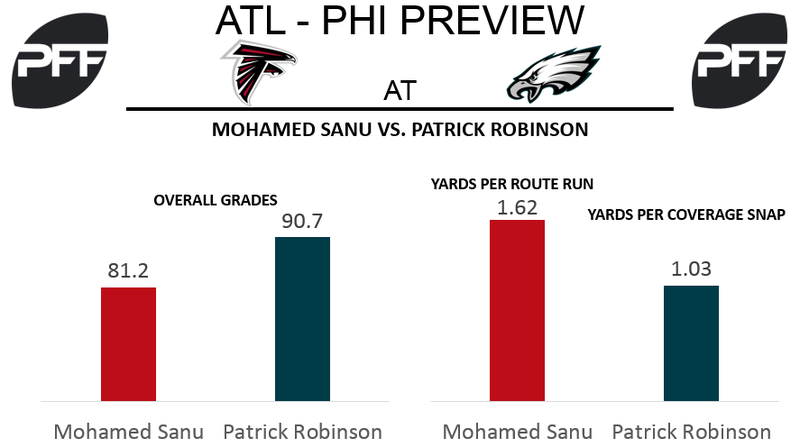 WR Mohamed Sanu vs. CB Patrick Robinson – Given his stature as an elite player, Julio Jones will see plenty of attention from the Eagles’ defense. With so much attention on Jones, fellow wide receiver Mohamed Sanu will have to step up and provide another weapon for the Falcons to utilize. Sanu has been a solid player for the Falcons this season particularly out of the slot, as he ranks 20th among wide receiver in overall grade with a grade of 81.2. The Eagles will counter with one of the best slot cornerbacks in the league in Patrick Robinson. The eighth-year veteran is having his highest-graded season of his career, earning the fourth-highest overall grade among cornerbacks (90.7). RB Devonta Freeman vs. LB Mychal Kendricks – Devonta Freeman has been one of the most difficult running backs to tackle this season and will certainly be a factor for the Falcons. This season, Freeman ranked ninth among running backs with 36 forced missed tackles on run plays. Linebacker Mychal Kendricks will be called upon to slow Freeman down in the running game. Kendricks has been the primary run stopper for the Eagles, as his 8.7 percent run-stop percentage was the highest run-stop percentage among Eagles linebackers this season. T Ryan Schraeder vs. Edge Brandon Graham – One way the Eagles can help slow down Freeman and Sanu is by winning the battle in the trenches. Brandon Graham is one of the best edge defenders in the NFL and is more than capable of giving the Falcons’ offense fits. Graham is consistently one of the highest-graded edge defenders in the league, and this season has been no different. Graham is tied for eighth among edge defenders in overall grade (91.3). Graham spends the majority of his time rushing from the defense’s left side, meaning Ryan Schraeder will see plenty of Graham. Schraeder is in for a difficult battle, but he did an exceptional job in pass protection all season, as his 97.1 pass-blocking efficiency rating ranks seventh among all offensive tackles this season. T Lane Johnson vs. Edge Vic Beasley – The Eagles will look to slow down a fast and aggressive Falcons defense this week, and it starts in pass protection and with Lane Johnson. Philadelphia’s right tackle had another strong year in 2017 and earned an 85.0 pass-blocking grade. Johnson surrendered 20 total pressures (including three sacks) on 553 pass-blocking snaps, which gave him a 97.2 pass-blocking efficiency. This mark was third-best at his position. In his past four games, however, the former first-round pick allowed nine total pressures, which is concerning given his competition. On the other side of the line, Vic Beasley will look to move on from a rough regular season and hope to make an impact on another Falcons playoffs run. Beasley collected one sack and three hurries against the Rams last week, continuing the work he did in the Falcons’ run to the Super Bowl last year, as last season he had nine pressures three postseason games. The former Clemson Tiger’s 8.0 pass-rush productivity in the regular season ranked 67st at his position. He managed a pass-rush productivity of 9.8 against the Rams. Eagles backfield vs. Falcons run defense – Philadelphia’s strong running back committee produced the league’s third-ranked rushing offense during the regular season. Jay Ajayi and his 83.0 overall grade led the way. Ajayi forced 46 missed tackles on the year, and he averaged 3.59 yards after contact per attempt during his time with the Eagles. LeGarrette Blount will get his fair share of carries on Saturday as well after a strong first season in Philadelphia. Blount’s 3.56 yards after contact per attempt ranked third among running backs and his 36.9 breakaway percentage ranked fourth. 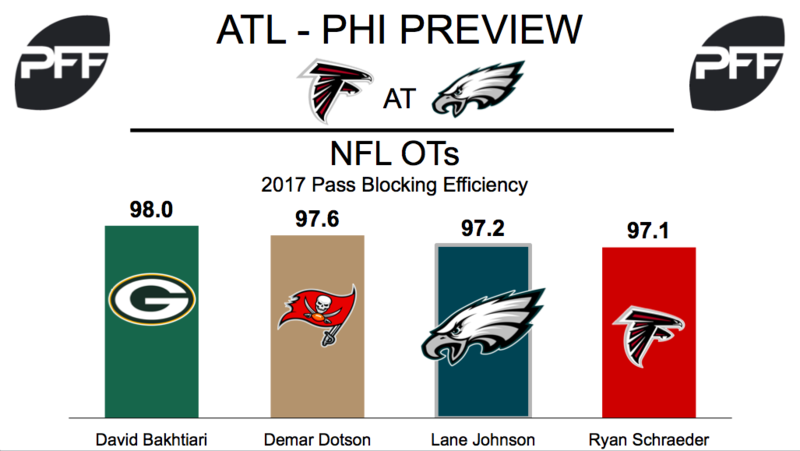 Atlanta’s run defense was not their best trait in 2017, so this will be a key matchup for the team. Known more for his coverage ability, Deion Jones led all Falcons linebackers with 25 run stops, but his 7.0 run-stop percentage ranked 43rd at his position. The key for Atlanta’s hope to contain the running game may be DI Grady Jarrett. He earned an 87.0 run-defense grade this season while pacing the team with a 9.5 run-stop percentage. TE Zach Ertz vs. S Keanu Neal – Ertz was not as productive towards the end of the year, but he still had an excellent 2017 overall. The former second-round pick ranked among the top-five tight ends in targets, receptions and receiving yards, and earned an 85.7 receiving grade. This mark ranked third at his position. Ertz’s 2.0 yards per route run was also fourth-best among tight ends. The Eagles could employ a conservative game plan this week with Nick Foles at quarterback, so the former Stanford Cardinal could be targeted early and often in the middle of the field. Look for Keanu Neal to get plenty of coverage snaps across from Ertz. Known as a strong run defender, Neal also earned a solid 82.6 coverage grade in 2017, but he did rank fourth-to-last among safeties in coverage snaps per reception allowed (11.7). When matched up against tight ends over his last six games, Neal surrendered seven catches on 11 targets for 95 yards with one touchdown allowed, but he also got himself an interception.